I'm here at ACC 2011 and everyone has an iPad. The iPad is everywhere on the exhibit floor. All the cardiologists seem to be using iPads to view EKGs and echocardiograms. It's great to see the attention mobile apps are receiving at the ACC Central booth. 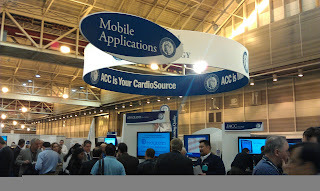 I saw Epocrates, Skyscape, and other mobile app providers speaking with cardiologists about mobile apps. This week, Epocrates is giving away the Echocardiography Atlas for free. You can download this app for free from April 2nd to April 10th. This app is available for iOS. If you swing by the ACC Central booth, you can pick up a free 1-year subscription to Epocrates Essentials for cardiologists.